With an enhanced focus on the cost effectiveness of the range, APC by SchneiderElectric, a leader in critical power and cooling services, has announced the immediate local availability of its NetShelter VL enclosure. With a continued focus on the cooling, power distribution and cable management features that users have come to expect from the company, the APC NetShelter VL enclosure provides a reliable rack-mount environment for mission-critical equipment. It also offers additional optional features such as side panels, casters and rear cable channel, all of which aid in reducing the cost of the base enclosure. This is according to Thierry Chamayou, channel director: Middle East and Africa for APC by Schneider Electric, who says that while the range has been designed for use in low to medium density server application environments, the features inherent to it make it comparable to most high-end enclosure offerings. “The NetShelter VL is highly integratable with APCs InfraStuXure cooling, power distribution and cable management products, all of which work seamlessly with the enclosures to provide a complete IT infrastructure support system,” he says. “Vendor neutral mounting guarantees compatibility with all EIA-310 compliant 19-inch equipment and APCs ‘Fits Like a Glove’ money back guarantee provides peace of mind for its customers knowing that compliant equipment will fit the enclosure. 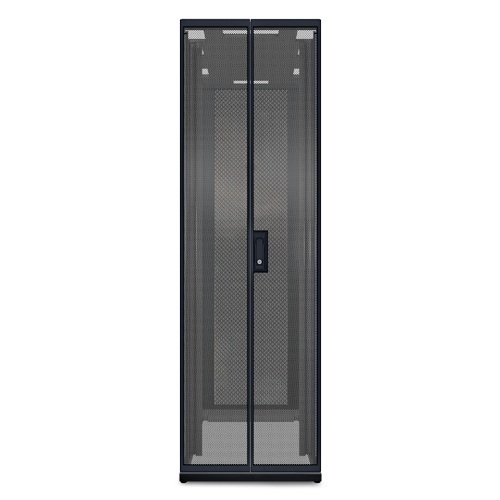 The NetShelter VL offers a variety of side panel options, all of which make for easy and safe handling with the added security of being lockable, but it is in its abilities in cable management where the range truly shines. “With large cable access slots in the roof providing access for overhead cable egress, and a bottom design that allows for unobstructed cable access through a raised floor, the NetShelter VL enclosure enables the effective organisation of data cables within a rack environment. In closing, the NetShelter VL enclosure provides users with a cost conscious, customisable and secure housing solution, which integrates seamlessly with a broad host of products and equipment while reducing the risk of electronic damage, concludes Chamayou. Previous articleBig brother website can’t handle the traffic! Next articleIs Africa ready to have a DotAfrica domain name!